That's right theatre fans. One of Broadway's most beloved shows of all time is now available for purchase, and at prices that can't be beat. Fiddler on the Roof, which believe it or not premiered on Broadway over fifty years ago, is set to begin previews at the Broadway Theatre on November 20. Opening night is for December 20. This new production, which is being directed by Tony winner Bartlett Sher, (South Pacific, The King and I), will star Tony nominee and Broadway favorite Danny Burstein. Playing his long suffering wife is fellow Tony nominee Jessica Hecht ( A View From The Bridge, Friends). I have been a huge fan of both Mr. Burstein's and Ms. Hecht's work over the years, so I have no doubt that they are going to be excellent in this new revival. Now as I was saying before, tickets for the show are now on sale, and at some amazing prices. Be advised that while this "Insider Price" is good thru February 28 it is not good for performances beginning on December 25 thru January 2, and as always subject to availability. 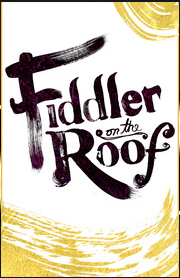 Get your tickets to see Fiddler On The Roof at the Broadway Theatre. Expect it to be a big contender at next year's Tony Awards. Until next time theatre fans.